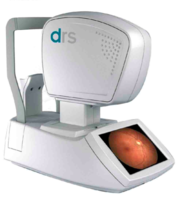 During your eye exam you will have a thorough health history and an automated visual fields-the latest in Frequency Doubling Technology, to provide state of the art perimetry for diagnosing Glaucoma and Neurological as well as Retinal pathology. Additional testing will be done for a host of ocular diseases and disorders. 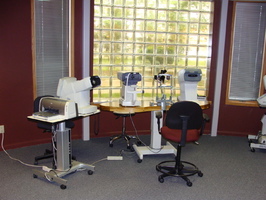 Most exams will include Dilation of the patients eyes to provide the most thorough exam. All testing is in additon to determining refractive error for glasses, bifocals and contact lenses. What frames look best on you? What glasses should you choose for your vision and your viewing habits? Each customer has individual requirements in terms of vision correction. With our opticians you can count on getting competent, personal and detailed advice. Your glasses don't sit properly on your face any more? The arm on your frames is broken or twisted? Our friendly team is always here to handle small adjustments, repairs or cleaning for you immediately and most can be done free of charge. Free nosepads for patients who purchase glasses in our shop.